Kangaderoo Custom QR Code. : Unlocking QR Code secrets. Quote from the movie X-Men: First Class: "To unlock your power. To make you embrace it." 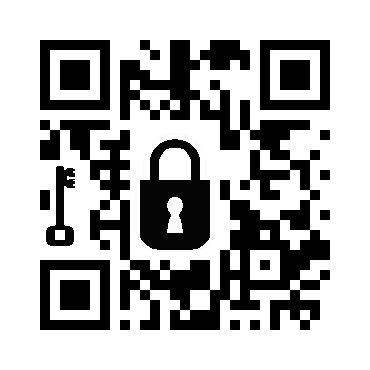 QR Code defines the word element for the room used for a single black or white squire. When a image is drawn using only squires this raises the following question. How to make rounded corners in graphics? Using the size of the qr code's elements, the qr code itself can be drawn in a grid. Each grid position will be build up using a number of pixels. 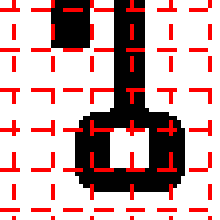 The red lines show the grid size of 10 * 10 pixels. By making sure a single grid point or element is predominantly light or dark, the edges of the grid can be used to insert more detail on a inserted graphic. The detail drawing shows the changes in the graphics showing the key, this key has been deliberately being drawn off grid. resulting in some 50% light/dark elements. After inserting these pictures, the QR code content and error correction is recalculated to result in a fast scanning and error free code. Since the error correction has been made intact again even if a grid point that is 50% light/dark (this element could be read incorrectly depending on reader app, light conditions, paper conditions, angle etc) is misread this single element will be corrected by the remaining error correction capability. On my site a lot more examples of what is graphically possible with QR Codes can be found in the gallery.